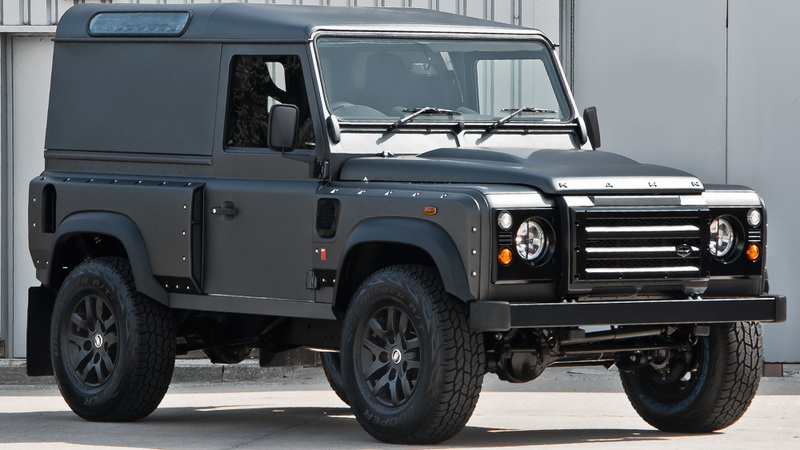 Άλλη μια νέα πρόταση του A.Kahn Design για το Land Rover Defender. Βασίζεται πάνω στην κοντή έκδοση XS90 και μηχανικά φορά τον 2,2-λίτρων TDCI κινητήρα. Το αυτοκίνητο ανήκει στη κατηγορία Chelsea Wide-Track και εξωτερικά οι Βρετανοί τοποθέτησαν νέο bodykit με φαρδύτερα φτερά και ενσωματωμένους αεραγωγούς, καπό με εισαγωγές αέρα, λασπωτήρες, νέα φωτιστικά σώματα και φώτα ομίχλης, νέα μάσκα με τα λογότυπα της εταιρίας, τις ζάντες Defend σε διαστάσει 8×16 1948 με μαύρο σατινέ χρώμα με ελαστικά 235/85 και τις σταυρωτές απολήξεις της εξάτμισης που αποτελούν σήμα κατατεθέν της εταιρίας. Είναι βαμμένο σε μαύρο σατινέ χρώμα, το οποίο το ονομάζει volcanic rock satin. Στο εσωτερικό έχουν τοποθετηθεί GTB αγωνιστικά καθίσματα, νέο δερμάτινο τιμόνι, αλουμινένια πεντάλς, LED κρυφός φωτισμός, κόκκινο στροφόμετρο, ρολόι Churchill και πυροσβεστήρας. 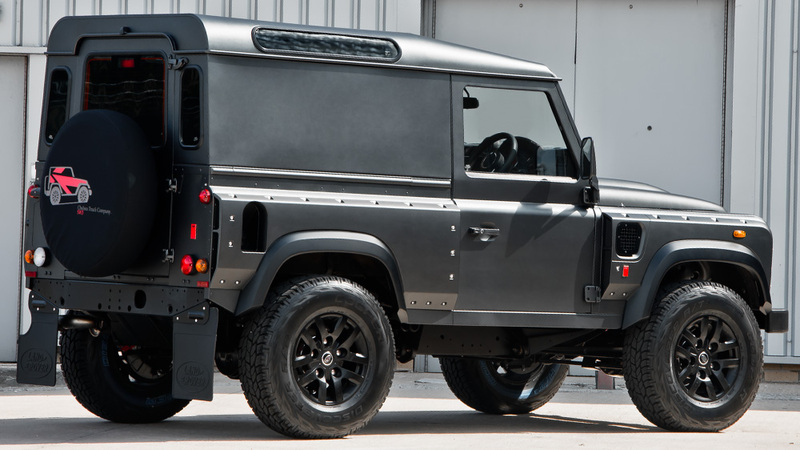 Paying homage to the Defender owners and enthusiasts amongst us, the Land Rover Defender 2.2 TDCI 90 Hard Top – Chelsea Wide Track is a unique interpretation of an iconic vehicle. Out in the wilderness, or in the City, the Kahn Chelsea Wide-Track Defender boasts an honest, minimalist approach to its design augmented by the means of responsible design coupled with exceptional strength. Raising the bar, yet staying true to A. Kahn Design’s celebrated philosophy of combining mechanical perfection and exterior beauty, fundamentals bearing diametrically opposing functions will appeal to customers far and wide. A modus operandi of club-class quality and high-tech engineering ensures every external modification serves to coax greater performance from the car. Bearing the DNA so typical of a thoroughbred Defender, the tasteful intensity of this volcanic rock satin beauty will leave a distinctive impression. Front and rear wide wings with integrated vents & bolt apertures, bonnet vents with mesh stainless steel, fog lamps, headlamp grilles with mesh – stainless steel, crosshair military headlights, side vents with mesh stainless steel, front grille with mesh – stainless steel, Kahn prototype wing badges, Kahn oval tailgate badge, 8×16 1948 Defend wheels in satin black, fitted with 235x85x16” tyres, the customary Chelsea Truck Company spare wheel cover, exhaust shields and mud flaps will leave a distinctive impression. Centered round a radical design and interconnected in order to coalesce design and engineering expression, the Kahn stainless steel quad crosshair exhaust system is a first cousin only to silence and manners. The generous interior, simply begs the beholder to take a step inside. 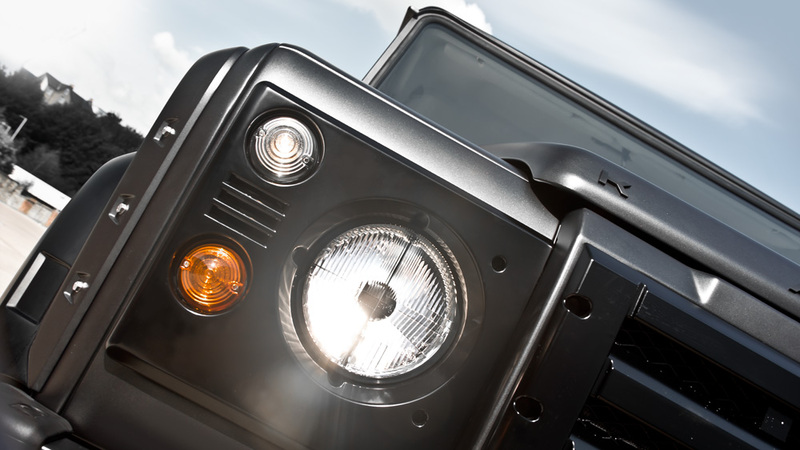 Like all A. Kahn Design models, the Wide Track Defender is oriented in every respect to the needs and wishes of the driver. 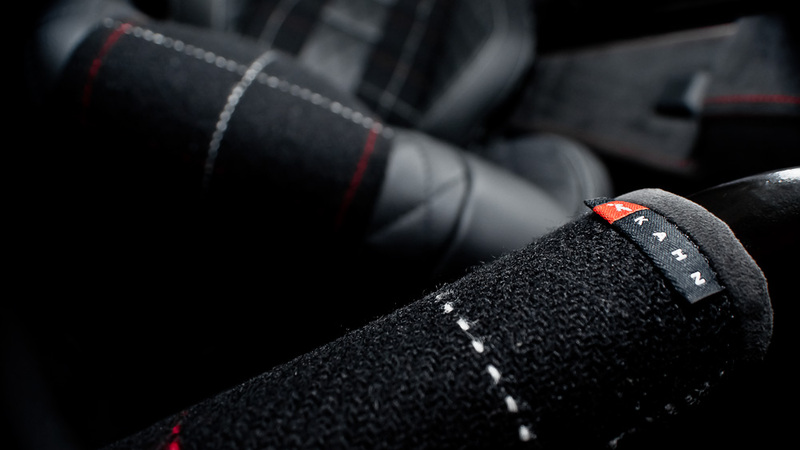 But now, the car’s occupants will have the benefit of supreme ergonomic comfort by the means of front sports GTB seats in quilted & perforated leather, single spoke steering wheel, Churchill time clock facia insert in red, dashboard, instrument binnacle, rear door panel and handle in Harris Tweed, and vented foot pedals in machined aluminium. 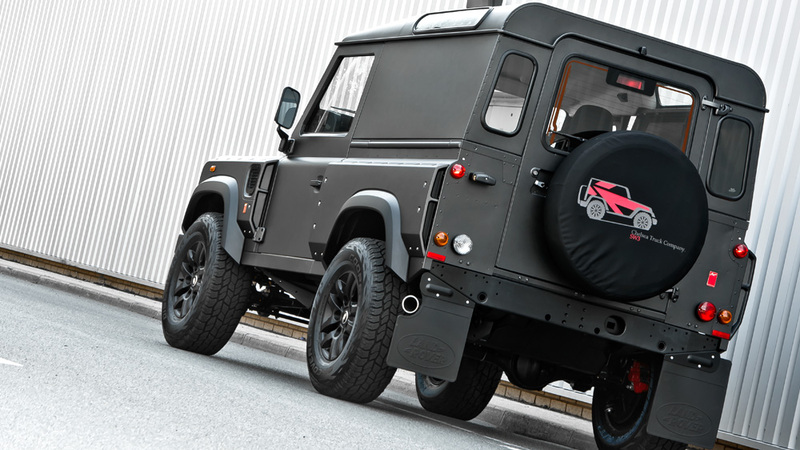 As expected, the Kahn Wide Track Defender can be ordered in every imaginable colour. If you, for example, desire a car with a full colour change (of your choice) and an interior akin to, let’s say your favourite leather reclining chair in your living room, we will be more than happy to oblige.